Have you ever been surprised by something? Most of us have: a slamming door, unexpected news, an old idea you suddenly see in a new light. In Dorothy Sayers’s essay “The Mind of the Maker,” she writes about the experience of a student who is surprised by a new revelation in his studies. She describes the experience as “Pentecost”—that “aha” moment when a new truth becomes clear. I had my own Pentecost experience recently as I re-read C.S. 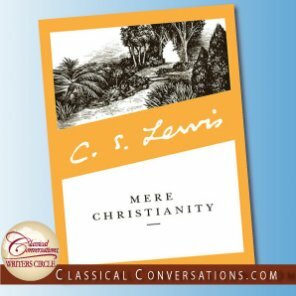 Lewis’s book Mere Christianity. I began to discover new truths about something I thought I already knew quite a lot about. Overconfidence! It will get you every time. Lewis is known for his brilliant and cryptic quips. Some seem difficult to grasp at first glance. For instance, “You can be good for the mere sake of goodness; you cannot be bad for the mere sake of badness” (p. 64). Intrigued, I began circling around the idea like a vulture stalking an injured animal! Is it true or rubbish? Is it dead or does it contain life? Then, after spending time contemplating and pestering my friends with continual “what can it mean?” questions, I picked up the book again and read on. In the pages that followed, the fog began to lift as Lewis gives examples and types and analogies that compare the idea to something common—a real life happening. The stories make the new truth easier to grasp. The comparisons lend the truth a shell in which to live—an artifact, and embodiment. It is in the haze of all this struggling to understand, the asking of questions, this basking in analogies, that “bang,” the “ah-ha!” moment happens. A truth you haven’t seen before, or at least not in this light, is found staring you between your eyes like a double-barrel shotgun. Comparison. Contemplation. Conviction. Suddenly, this new truth shines bright, and the familiar thing is seen with a new heart and fresh eyes. You are surprised, humbled, intrigued. The flaw in your natural understanding has been discovered and your self-satisfaction in your old understanding has been shattered. Your old understanding was incorrect—or, at the very least, incomplete. You say to yourself, “Hmm, that’s a new idea!” which of course it isn’t. The good news is now that this “Pentecost” has occurred, transformation can begin. Such is the journey of the dialectic. This movement from blissful over-confidence to surprise, questions, confusion, struggle, and doubt can be as unsettling as it is exhilarating when we realize there is more to something than we originally thought. With intention and practice, we can lead our children toward this journey through conversation. A young person might be confident and satisfied with his knowledge that Lee surrendered to Grant on the Appomattox steps in 1865. His contentment with this fact has temporarily lulled him into self-satisfaction. He knows what there is to know about the subject and that’s that! Then a wise parent or mentor begins to ask questions he has not thought about. What does it mean to surrender? Should Lee have surrendered? What happened after the surrender? How did the generals show respect to each other during the difficult meeting? Compare Lee’s humility with the attitude of prominent leaders today. The student has been invited to think on definition and authority, circumstance and relationship. He is swept away by the power of good questions and guided along with examples and types to compare and contemplate. How will this new truth affect his thinking and his actions in the future? At the end of the day, to the degree that the student has allowed the art of dialectic to take its natural course, the student is closer to wisdom than he was before. No longer satisfied with only facts alone, he hungers for deeper truths. In a way, he is a new creature with a new brain and a new outlook. He has battled to understand and been rewarded with an “ah-ha” moment. He makes changes in his thinking and he is the better for it. He asks himself, “Are there other things to learn, to know, to understand, to act upon?” The blessed result is an appetite for new surprises, new revelations, and new truths. He has been surprised by “Pentecost.” And if he is very lucky, perhaps it might happen again tomorrow. Classical Conversations in 2003 after moving to Virginia. Shelly currently serves as a Team Leader for the CC Academic Team.